One student passed 11 subjects, and another 10 subjects, the first time this has been achieved since the school began taking external exams in 1977. 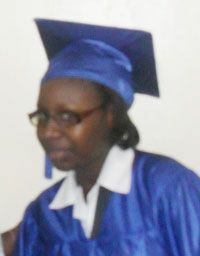 Kenlyn Wilson, who passed all eleven subjects she sat, attributes her success to the long hours of studying she put in. âWe went to school from Sunday to Sunday,â Kenlyn shared in an interview with SEARCHLIGHT last Sunday evening. She gained grade one passes in English B and Office Administration; grade two passes in English A, Electronic Document Preparation Management (EDPM), Social Studies and Integrated Science; and grade three passes in Mathematics, Biology, Chemistry, French and Caribbean History. Kenlyn, who is the daughter of Kendoll and Caroline Wilson of Union Island, plans to attend the St. Vincent and the Grenadines Community College in September, where she hopes to take courses in Biology and Chemistry. She hopes one day to become a paediatrician. Sixteen year old Marleya Adams, who passed 10 of the 11 subjects she sat, was elated when she received her results. âI was happy not only because of my success, but also because I made my parents, family and the people of Union Island proud,â she told SEARCHLIGHT. The daughter of Gemma and Kenvil Adams obtained grade one passes in English A and English B, with grade two passes in Caribbean History, Social Studies, EDPM, Food and Nutrition and Integrated Science. She obtained grade three passes in Mathematics, Biology and French; with a grade four in Chemistry. Marleya has not yet decided on her career path, but she has a keen interest in Marine Biology. Next month, when she begins studies at the St. Vincent and the Grenadines Community College, she hopes to take Psychology, Biology and Law. She expressed her thanks to God for the strength and courage to reach this far, her parents for their support and advice and to the principal and staff of the Union Island Secondary School. Kristy Shortte, who was the schoolâs 2011 valedictorian, was successful in all nine subjects she wrote. She obtained grade ones in English A and Office Administration – both with distinction. For Social Studies, Principles of Business and Integrated Science, the teenager obtained grade two; she was awarded grade three for Mathematics, Biology and French. Saying that she was overjoyed, Kristy told SEARCHLIGHT that she both worked and prayed consistently. She plans to take Economics, Psychology and Mathematics when she takes up studies at the SVG Community College next month. On leaving school, she hopes to join the Immigration Department, after which, her ambition is to become a detective with the Federal Bureau of Investigation. She is the daughter of Jeanna and Jeffrey Shortte. Principal Godwin James is understandibly elated at his schoolâs 78 per cent overall pass rate, which places the school at the fifth position nationally for CSEC 2011. Last year, the school was also fifth nationally, with a 80 per cent pass rate. James told SEARCHLIGHT that for 2011, he had set a goal of 80 per cent or more for his school. James shared that one boy, who was reading at a grade three level upon entry to the school, obtained 6 subject passes including English A. All students achieved subject passes, he said. 37 students were entered in 19 subject areas, an increase in student entry over 2010, which had 23 students entered. There were 100 per cent passes in seven subject disciplines: 0ffice Administration, Home Management, Agricultural Science, Building Technology: Construction, Caribbean History, English B and Physical Education and Sport, which was introduced at the school in January 2010 at CSEC for the first time. Last year the school achieved 100 per cent passes in 9 subject areas. James expressed his thanks to the CSEC teaching staff, some of whom he said worked 7 days a week to ensure syllabus completion and thorough preparation of students for their CSEC exams.